Xel Ha meaning ‘where the water is born’ is approximately 75 miles south of Cancun and within 8 miles of the ancient Mayan ruins of Tulum. 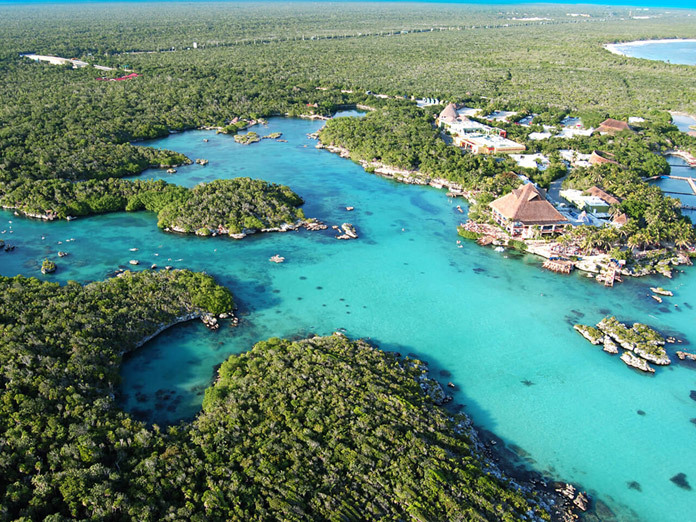 Xel Ha can best be described as a natural aquarium and there is no shortage of things to see and do, both those offered as part of your park entrance fee and optional activities such as dolphin swims. 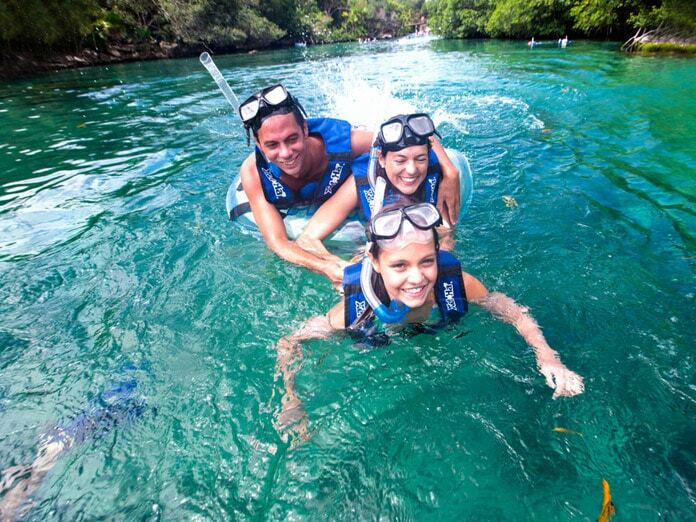 Xel Ha Tours are the way most people choose to spend a day at this beautiful ecological park close to Cancun. You can choose to combine your Xel Ha tour with part of the day spent at Tulum. In my opinion there is more than enough to occupy a full day at Xel Ha but if you prefer to fit in two sites on the same day then it can be done. The regular tour options are featured below but if you have a group then Xel Ha private tours are also available. Private tours work out around the same price for more than six adults in a party, or for smaller groups perhaps the added freedom to choose your own itinerary may make a private tour an option to consider. Optional activities are available for you to schedule once inside the park. However, if you want to swim with the dolphins then I would recommend that you make advanced reservations as it is a very popular activity and fills up very quickly, often days beforehand. 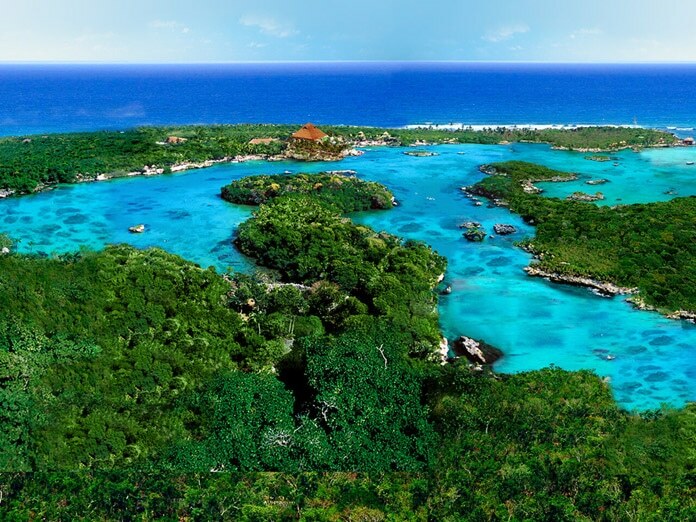 The tour offered below offers three possible itineraries, Xel Ha All Inclusive or a Xel Ha /Tulum combo. The combo tour is available both all inclusive and non all inclusive. 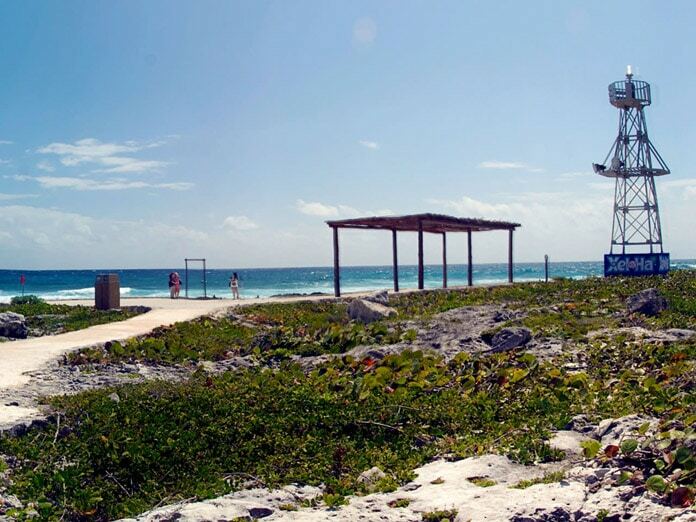 Pick up from your hotel is around 7:15am and if you choose the combo tour you’ll leave Tulum about 12:30. Depart Xel Ha around 5 and be back at your hotel for 7pm. A Xel Ha private tour works out around the same price if there are six or more adults in a party, or will be suitable for smaller groups who prefer to choose their own itinerary. 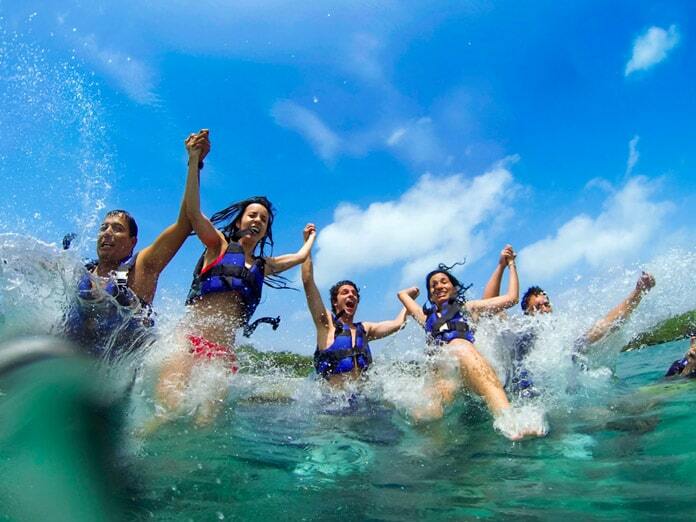 If you’re a small group then the regular Xel Ha tour is a cheaper option. 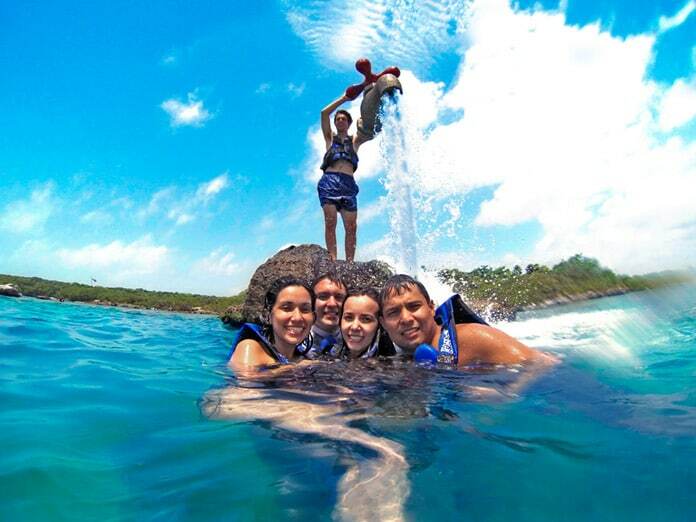 You can choose to combine your private Xel Ha tour with part of the day spent at Tulum. In my opinion there is more than enough to occupy a full day at Xel Ha but if you prefer to fit in two places on the same day then it can be done. Private tours are exclusive to your group so you decide the itinerary, it’s probably better to visit Tulum in the morning if you’re ding the combo tour but if you prefer it the other way round then that’s no problem. Pick up from your hotel is at your choosing, but an early start say 8pm or so is recommended in order to get the most out of the day. Return to your hotel can be at any time but Xel Ha closes at 5pm. The inlet at Xel Ha is a large enclosed area of sea bounded on sides by rocks and divided from the open ocean by an 80 meter floating bridge. Within the inlet, depth varies but is usually around 12 feet. A wide variety of underwater wildlife can be viewed in the sheltered waters and with no current. Numerous lifeguards are on hand at Xel Ha to further ensure your safety. By the floating bridge is where the water becomes deeper, here you can feed massive fish and swim among them. 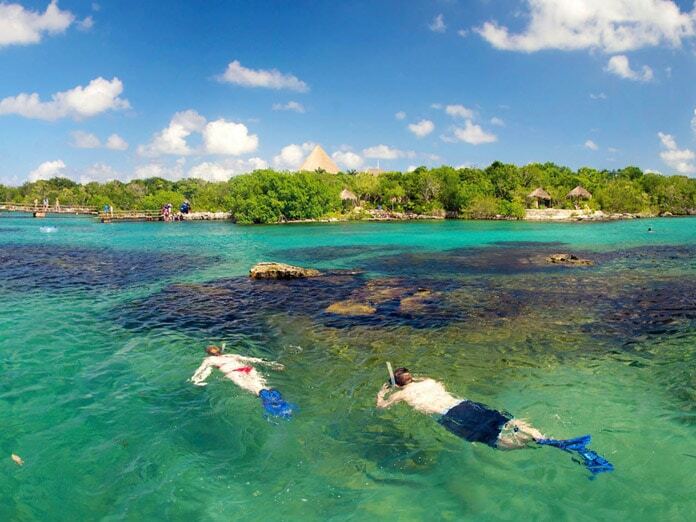 Snorkeling at the floating bridge is the best spot at Xel Ha in my opinion. 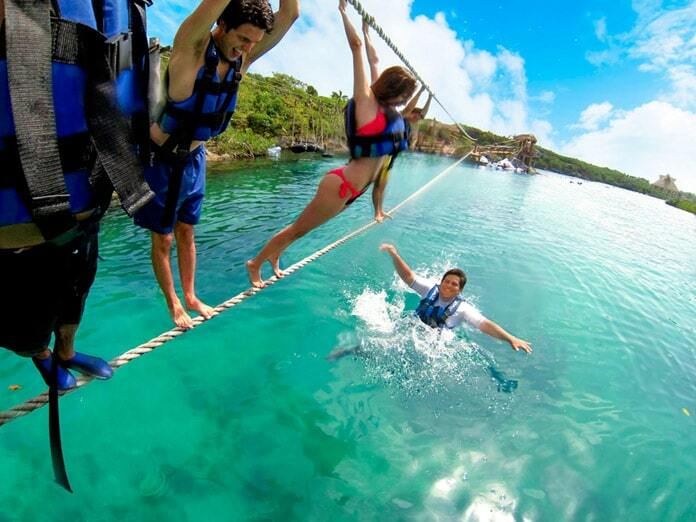 On the ocean side of the floating bridge is where the dive, snuba and sea trek optional activities take place. Take a walk along the myriad of paths through the tree nurseries where trees of all shapes and sizes are nurtured and provide home to iguanas and other native wildlife. 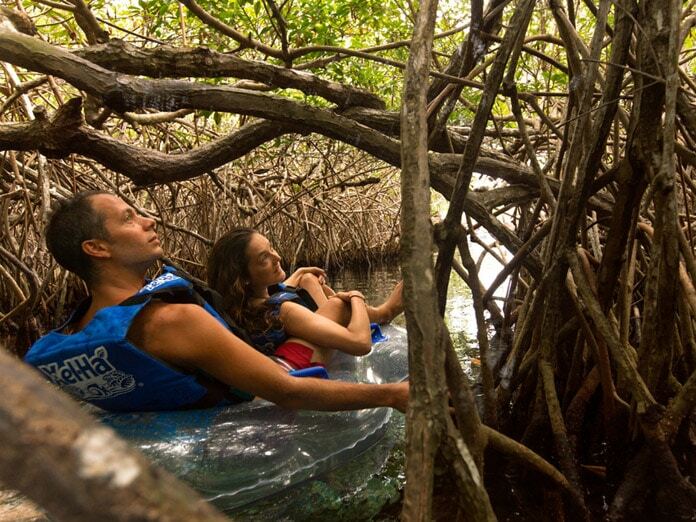 Explore the mangrove forests the only trees that grow in saltwater or float along the underground river. Relax on the 300yds of fine sandy beach equipped with free loungers and hammocks and take in the spectacular view of the Caribbean Sea or perhaps ease those tired muscles with a professional massage at the Xel Ha spa. 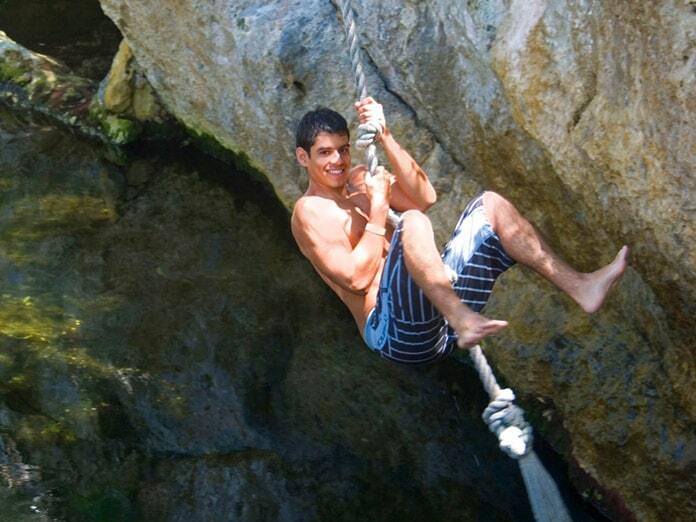 For the more adventurous jump from courage cliff a 5 meter drop into the warm but refreshing ocean waters. 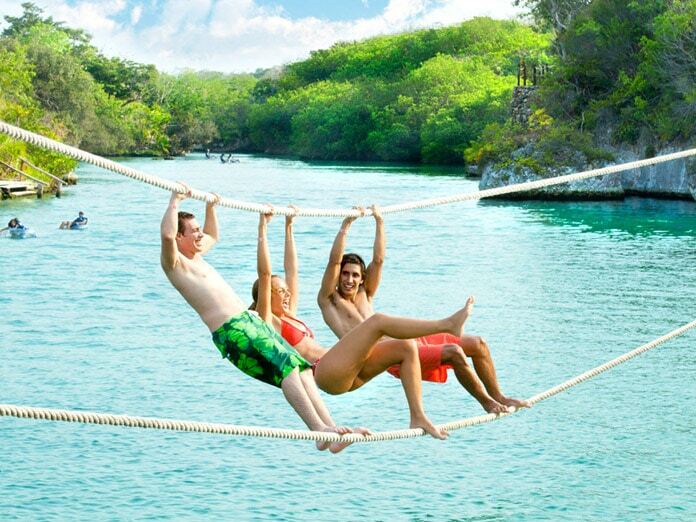 With rope swings, an adventure playground and a suspended rope crossing above water kids will love Xel Ha too. 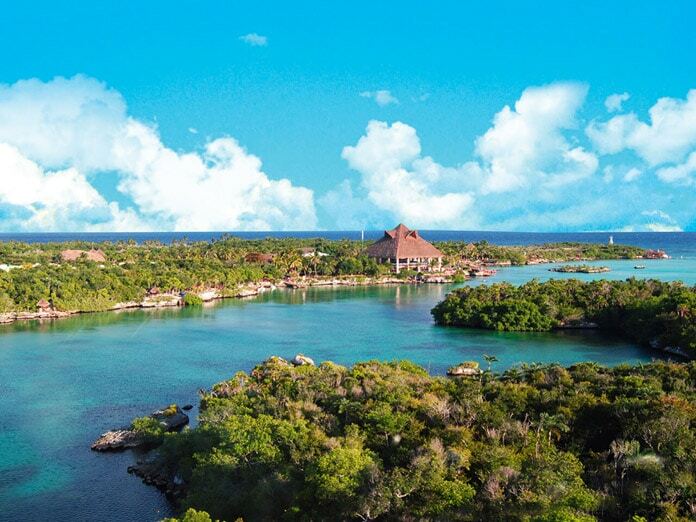 Xel Ha offers six different restaurants from fast food to Mexican and Italian, some offering live music. Browse the souvenir stands and examine the local handmade crafts. Information booths, showers, lockers and full handicapped and stroller access means that there is something for everyone at Xel Ha. Most people visit Xel Ha as part of a tour, but if you prefer to do things independently it’s not difficult to find your own way there. Make sure you buy your tickets in advance to take advantage of the online discount or you’ll pay more on the day. Xel Ha is 75 miles south of Cancun. If you prefer to be independent and make your own way there it’s not difficult. For those that decide not to rely on their own steam and take advantage of a tour then please check out our Xel Ha Tours. If you have a hire car then you need to head towards highway 307 which is the main North South road from Cancun right down to the Belizean border. If you’re starting from the Hotel Zone it’s probably easiest to join the 307 at the airport junction, so head away from downtown. You can join the 307 at the downtown end but it’s a little more complicated if you’re not familiar with downtown Cancun. Head south and you’ll pass by Puerto Morelos, Playa Del Carmen and Xcaret. Xel Ha is 35 miles south of Playa del Carmen and before you reach Tulum. Signposts are very clear and it is hard to miss. Highway 307 is nicknamed the ‘highway of death’, as there are frequent accidents, so drive carefully. The standards of driving in Mexico are poor at best and there are plenty of idiots on the roads. If you prefer to travel by bus then the downtown Cancun bus station provides frequent daily buses to Xel Ha, the bus ride takes approximately 2 hours and costs around $10 per person. The bus stops at several points on the way, and has a 10 minute or so layover in Playa Del Carmen, before recommencing the journey. Buses are clean, air conditioned and usually equipped with a TV, although the programs aired tend to leave a lot to be desired! Make sure you tell the driver you’re going to Xel Ha (it’s pronounced “shell ha”) and maybe remind him 20 minutes or so after leaving Playa del Carmen. More than likely he’ll probably call out anyway but no harm in reminding him in any case. Try to sit near the front of the bus so that you can hear the driver call the names of the various places and be ready for the Xel Ha stop with your bags and possessions. He wont drop you right by the entrance gate, he’ll stop on the main highway so there will be a short walk involved. 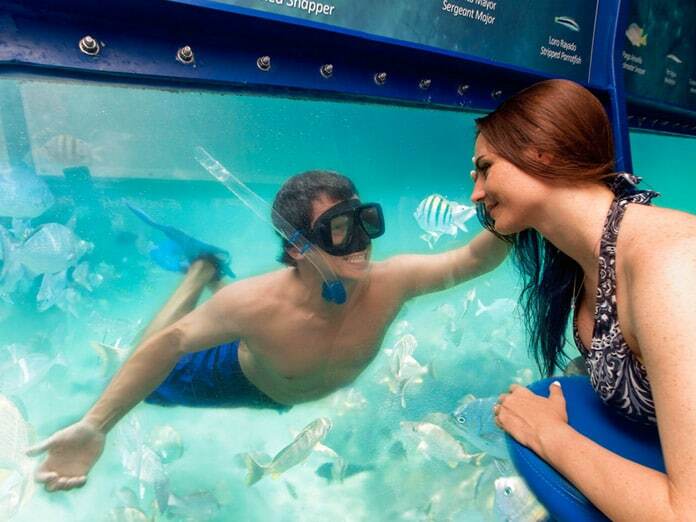 However, there is some free transport that will take you right to the Xel Ha entrance. On the way back make sure you have some mosquito repellent with you if it’s after dark. Be careful of the road and keep your eyes peeled for the bus as they travel fast and are not easy to pick out from other traffic when all you can see are headlights. Do not be shy at trying to get on the bus first, everyone else wont be and if the bus fills up you’ll be left standing at the side of the road for the next bus, while yet more mosquitoes nibble on your exposed flesh! 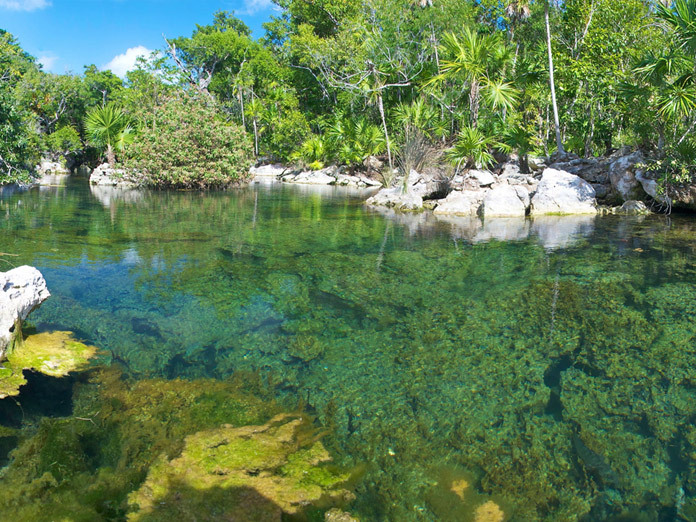 What is Xel Ha park like? Our full guide plus great tips!